Scheduling reports allow you to stay on top of your business by analyzing your sales, profit, and inventory weekly, monthly or yearly. 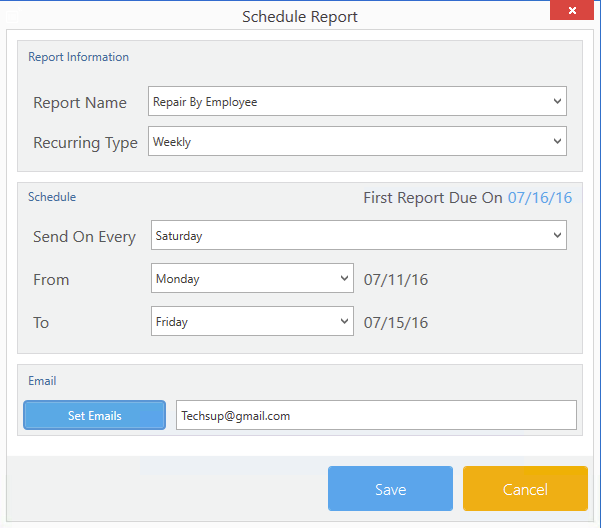 You can schedule a variety of reports that will be sent to your email according to their scheduled time. Click on the Report Schedule tab. Select a Report by clicking on the Report drop down menu. Select when you want the report to be sent weekly or monthly by clicking on the recurring type drop down menu. In the Schedule section, select which day you want the report to be sent by clicking on the drop down menu. Select the email address from the list of e-mail address list in the Email settings window.